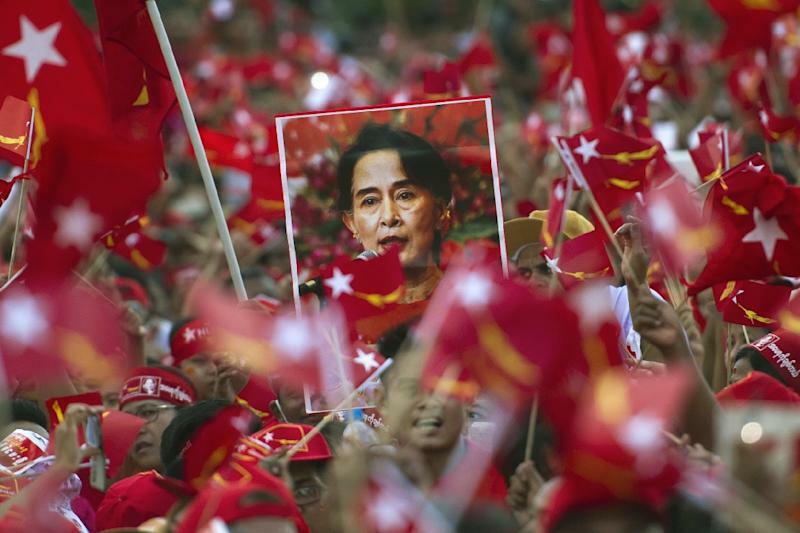 Yangon (AFP) - Myanmar's opposition looked poised Tuesday for a landslide poll win, but even if Aung San Suu Kyi's party does form a majority, governing a impoverished nation where the military retains huge influence will be no mean feat. Here's what we know so far about the election and what it means for the nascent democracy. Right now it's hard to say unequivocally, as full results aren't in. But from the few seats declared, Suu Kyi's National League for Democracy (NLD) party is sweeping the board. Her party has won 78 of the 88 seats announced so far in the lower house, which has a total of 323 seats up for grabs. They have done particularly well in their Yangon stronghold, taking all the city's declared seats, as well as making strong gains in the important Mandalay region. And they've even taken a few seats in Myanmar's ethnic minority regions. That suggests the NLD may mop up in regions where many thought the vote was more likely to go to smaller ethnic parties. The NLD is also dominating many regional parliamentary seats -- 142 out of 162 declared so far -- which could give them significant influence over important local authorities. There are a total of 652 regional parliamentary seats to fill. No upper house results have been released yet, nor do we know yet whether Suu Kyi has won in her own constituency of Kawhmu. Will the NLD form the next government? At the current rate of results, it certainly looks like it. Under Myanmar's complicated 2008 military-crafted constitution, the NLD needs to take at least 67 percent of seats in both the lower and upper houses to form a government. Its rivals, the army-backed Union Solidarity and Development Party (USDP), only needs to win a third. That's because a quarter of seats in the legislature are reserved for military appointees. In a BBC interview Tuesday, Suu Kyi said she believed the NLD were on track to take 75 percent of seats, which would push her party well over the 67 percent threshold. Firstly, Suu Kyi can't be president -- she is currently forbidden from taking the top spot under the constitution, which bans those with foreign children. Her two sons are British. Secondly, even if she forms a majority, any major constitutional reform is going to be very difficult. The army bloc within the legislature can effectively veto any changes to the charter. That means a Suu Kyi presidency remains a distant prospect -- an obstruction the powerhouse politician cryptically vowed to circumnavigate by being "above the president". A third issue is that the military still holds other constitutional cards, including the top security posts at the home, defence and border affairs ministries. "There are lots of levers of power and they control the ones they need to," said Richard Horsey, an independent Myanmar analyst. How will the president be chosen? Myanmar's president is directly elected by the legislature. With the existing parliament sitting for a final session from Monday, new MPs won't take up their seats until the end of January. Once the new parliament is up and running, electing the new president can begin, some time around February or March 2016. The lower and upper houses will each put forward a candidate, as will the military bloc. The whole parliament then votes on the three -- the winner becomes president and the losers vice presidents. Even if the NLD's chosen candidate wins, he or she will likely have at least one military-backed vice president. Nicholas Farrelly, director of the Myanmar Research Centre at the Australian National University, said the NLD is well aware of the uphill struggle they face. The NLD "has thought about governing for more than a quarter of a century. That's a long time to wait", he said.